The British Gazette » David Cameron: The biggest fool in Christendom? As he contemplates the final days of his political career, Disastrous Dave may well be ruefully reflecting on his Missed Opportunity. This was the United Kingdom Alternative Vote Referendum held on Thursday 5th May, 2011. 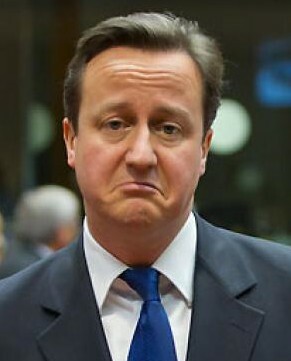 Disastrous Dave sealed his party’s fate when he decided to oppose the idea of AV and campaign against it. This clearly demonstrated that the man is a Fool of the First Order. Because the Liberal Democrats have been campaigning for electoral reform since before WW2. They have always campaigned for a system of genuine proportional representation such as the Single Transferable Vote – as used in Eire. This would have given them what they have always sought since the 1940s – coalition government. However, due to their weak negotiating position the Lib-Dems were prepared to settle for the Alternative Vote – which is not PR. Had Cameron had gone the extra mile and told Clegg that he and the Tories would actively and enthusiastically back the Lib-Dems and back AV as a united coalition but on the understanding that the Lib-Dems would support equal sized constituencies Clegg would have bought it. Had Disastrous Dave done this he would have achieved a master stroke for he would have taken a huge chunk out of Labour in the North of England and have effectively seen off UKIP for UKIP would with AV pick up large numbers of 1st Preference votes from the Tories but most of these voters would select the Tory candidate as 2nd Preference. A win, is a win, is a win! As they say. Now Disastrous Dave has to look forward to being replaced by Theresa May if a Grand Coalition is formed with Labour OR Boris (Flashman) Johnson if Edward the Unfortunate attempts to form a minority government. Of course, if Strict Mistress Sturgeon orders Edward the Unfortunate to bring the Additional Member system for the Commons (on a 50/50 basis?) the Tory’s goose will be well and truly cooked! A certain Lord Clegg of Hallam will of course be ecstatic! - PR at long last will give the Lib-Dems centre stage in British Politics. 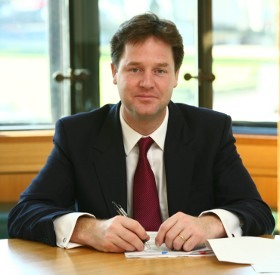 - Lord Clegg will be one of the UK’s Governors – AKA an EU Commissioner. Remember, the EU ALWAYS looks after its own and repays loyalty handsomely. What can I say ? ” Lord Clegg of Hallam “, on losing his seat on Thursday, will, in all probability, return to a highly paid job in Brussels.. Forget not that he did his potty – training over there so it will all be ‘ old hat to him. Just pick up where he left off. Being in line for a fat pension ( from our taxes ) for his former ‘ loyalty ‘ to the EU, he stands to lose it all should he ever utter one word of criticism about EU tactics. No wonder he treads carefully . An utterly treacherous politician, the sooner he is ousted, the better.